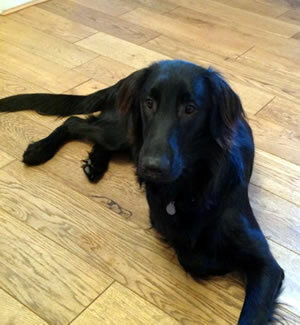 Monty was our 11 month old beautiful flat coated retriever. He had been a chewer from day one. He shredded 2 cloth baskets, towels, bedding, destroyed 3 remote controls – one resulting in a dash to the emergency vets having swallowed a battery. Chewed the newel posts/spindles and banister the skirting boards anything he could get his paws on. For Christmas we bought him some new toys to keep him occupied one being a rock hard nylon bone which we didn’t think he could destroy. At the beginning of January we ended up at the emergency vet as he started vomiting and couldn’t stop. On our walk he drank some dirty water and ate some horrible mud so we thought this might be the reason. The vet examined him and gave him anti-sickness and antibiotic injections and sent him home. We took him to our vet the next day but he seemed okay. A month later he woke up and vomited, but he seemed okay so we went for our morning walk. He had a good run round. We had been home for an hour when he started vomiting water and couldn’t stop. We took him to the emergency vet and explained the similar episode a month earlier. She examined him and gave him the same anti-sickness and antibiotic injections, which should have lasted for 12 hours, and told us to take him to our vet the next day. He started being sick again during the night. We took him to our vet the next morning. He operated to find what was causing the problem. He removed an 18 inch piece of bowel. The blockage was made up of splinter’s of wood, thread, fibres and much worst chewed hard nylon bone which had created a cheese grater effect for everything to cling too and as it tried to pass through the bowel had caused lesions which had turned gangrenous. He said there was another blockage further along but hoped he would pass this. Monty survived the night but he seemed no better in the morning, so the vet called and said he was opening him up again in case peritonitis had set in. We rushed to see him before he was put under and at this point told the vet if there was any doubt we didn’t want him to suffer. The outcome was that the other blockage needed to be removed and looked infected. This meant removing far too much and a greater danger of infection, sadly he had to put him to sleep. On reflection Monty had started eating his food slowly which is not a flatcoat trait. So whether this was a warning sign we will never know.